e) API marketing and promotional methods to be adopted. Once these have been decided, developers need to turn their attentions on API designing. Referring to well-illustrated use cases and contextual deployment instances comes in handy in this regard. In addition, the data format for the API – JSON or XML – has to be chosen, and a stand has to be taken on whether a REST or a SOAP API should be built. To expose the assets in a secure, systematic and effective way, adopting the dynamic API-first approach is important. Swagger 2.0 and API Blueprint are two commonly used tools for designing APIs. i) Public APIs, which facilitate public access of services and create entirely new ecosystems. ii) Private APIs, the main purpose of which is making internal IT operations more systematic and cost-effective. iii) Partner APIs, which enhance the reach of services by collaborating with select partner businesses. The API Planning and Analysis stage is more of a ‘preparation’ stage for the actual development to begin. Once the groundwork is complete, it’s time to move on to the next stage. This is the stage where actual coding is involved, to create a new API and, if required, integrate it within existing systems. Provided that the planning has been done properly and a proper API strategy is in place, the stage should not take up too much of time – particularly since there are plenty of resources already available for the creation and management of RESTful APIs. Some popular tools for building new interfaces are Postman, Runscope and APItools. An API can either give direction to the content distribution system of a firm, or expose the internal data structure, or both. Hence, API providers must simply grasp the exact technical requirements and capabilities of the program interface. In addition to the API hosting tools and management methodology, an understanding of the protocols to be used is important. Developers need to be aware of all the operations as well, the security features and access control options, and obviously, the quality of end user-experience the API will provide. The scalability and the size of APIs are also key factors to be considered. e) Django and Flask Web (for Python). Note: AppNow is also an often-used tool for API prototyping, data model specification and deployment, and demonstrations. Deployment with AppNow (with CRUD RESTful API and AngularJS) can be tested with the Swagger tool. Including rate limits is a common security strategy for APIs. These put an upper limit on the total number of network requests within a time-period (thereby reducing the risks of ‘flooding’). A robust real-time analytics and monitoring system also needs to be included in the API. Since the API lifecycle is iterative (and not ‘top-down’), it is easy to go back to the Analysis stage at any time and make changes, as and when required. d) Securing the API endpoints. One of the biggest inclusions in the third stage of the lifecycle is API testing and bug-fixing. With quality being the biggest bone of concern among API developers worldwide, it is only natural that many small changes and switches are done at this stage – to make the interfaces smoother and glitch-free. Initial user-opinions and feedback also need to be collected and analyzed (via suitable inbound methods). Note: API documentation, initiated in the previous stage, has to be regularly updated and maintained during the Operations stage. All the changes made in the structure of the API should be recorded in the documentation/changelog/release notes. ii) the second URL exists between the management tab and the API This one remains private and is not accessible to any third-party entity. There are certain features and solutions that any standard API management platform should offer. These include the API contracts, the security and access controls, the documentation, developer portal access, analytics and usage, and of course, all billing-related information. Sandboxing can be done for test integration, before the actual thing. For Public APIs, this is the stage where most of the marketing and promotional activities take place. The focus of API providers is to generate as much awareness as possible, through hackathons, online campaigns, detailed documentation (shareable) and other methods to enhance API discoverability. The value of the iterative nature of API development once again becomes prominent at this stage. Developers can move backwards to Stage 1 (Analysis) to expand the scope of interfaces, to Stage 2 (Development) to tweak the technical features of APIs or change the API versioning, or move directly to Stage 4 – in case it is confirmed that deprecation has indeed set in for a particular API. Boosting its discoverability and the usability. Users should be able to find the API easily, and not run into any problem(s) while working with the software. Creating interesting use-cases to highlight the utility of the API to app/web developers. Delivering top-notch developer-experience (DX) is always of essence. v) Community development (for selecting the right web and social media channels to promote APIs). Note: Creating a scheme to monitor the effectiveness of marketing campaigns should also be a part of an exhaustive API Developer Program. All partners should be leveraged properly, to maximize the outreach of the API in existing markets. None of these promotional activities would be of any value though, in case an API has reached the end of its journey – a stage when it no longer delivers value, and its purpose is no more in tune with the overall business objectives. In such cases, the concerned API is ‘retired’. Retiring an API is pretty much like discontinuing any piece of software. It happens when the usage metrics start to go down steadily, there is little or no innovation on the part of app developers, and/or a mismatch of revenue-related objectives. Decrease in community support and paucity of compatible plugins are also common reasons for API retirement. Fresh security threats is yet another factor leading up to APIs being withdrawn. 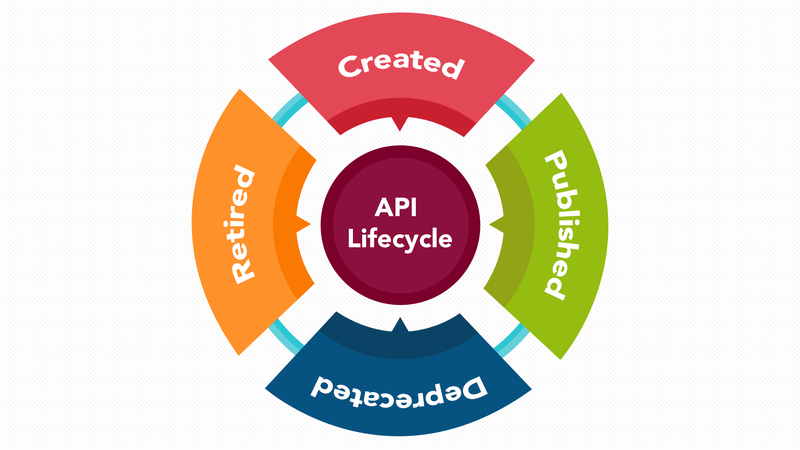 Thorough knowledge of the entire API lifecycle goes a long way in helping developers maintain high-end agility standards. Managing APIs is key for optimizing the initial plans and strategies, and getting the most out of the interfaces. What’s more, chances of compliance breaches and security attacks also take a backseat, when APIs are closely monitored and managed. With proper coordination of the API lifecycle (API governance), businesses can evolve with changing requirements and possibilities. And as we all know, a systematic approach always works!